After nearly a year of careful preparation, the 19 students and 7 adults in the travelling party bound for the Edinburgh Festival Fringe departed from Hilo on July 29. Families, friends, and school administrators gathered to send their best wishes and support. High school principal Lehua Veincent gave his heartfelt words of farewell and Kahu Brian Boshard gathered all present for a final prayer and blessing. 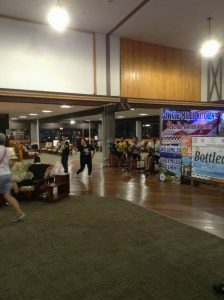 Excited and in good spirits, the students passed the time waiting for the flight with impromptu performances with the entertainers providing music in the airport lobby (among whom were KSH teacher Mr. Kaaa). Students danced hula with the musicians and recently graduated senior Pono Brown took the mic to offer some of his own Hawaiian music, all in the spirit of sharing. After thee flights (Hilo to Los Angeles, Los Angeles to Chicago, Chicago to London), the KSH travellers arrived at London Heathrow Airport and presented their passports at the UK Border on July 31st The weather was cool and comfortable. Highlights of London included a city tour (on the day of a major bicycle race – lots of road closures, but no traffic! ), a West End show (Charlie and the Chocolate Factory), an acting workshop at the Globe Theater, a visit to the British Museum, and a private showing of Hawaiian artifacts, and a visit to the Tate Modern art gallery. Accommodations were at Bankside, a student housing complex on the banks of the Thames river. On August 2nd the students and chaperones, along with all of the other schools who are participating in the American High School Theater Festival boarded travel coaches for the ten hour drive north to Edinburgh. 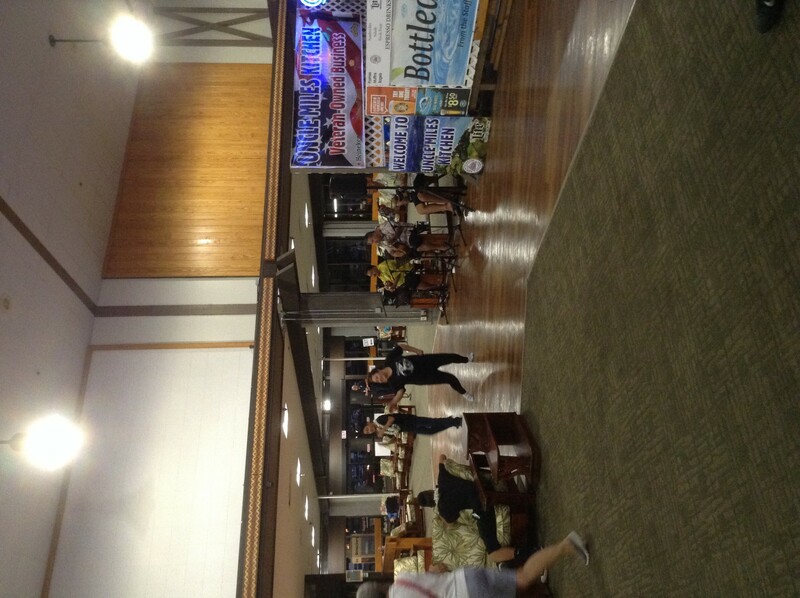 On bus #2 the KSH students were joined by students from Idaho (Eagle)and Maryknoll High School (Honolulu). It wasn’t long before ukuleles were unpacked, many songs were sung by all, bags of li hing fruits and mochi crunch were circulated, and new friendships were made. The school from Idaho is scheduled to attend a performance of Hāʻupu. It was early evening when the busloads of weary but anxious students arrived at the University of Edinburgh. 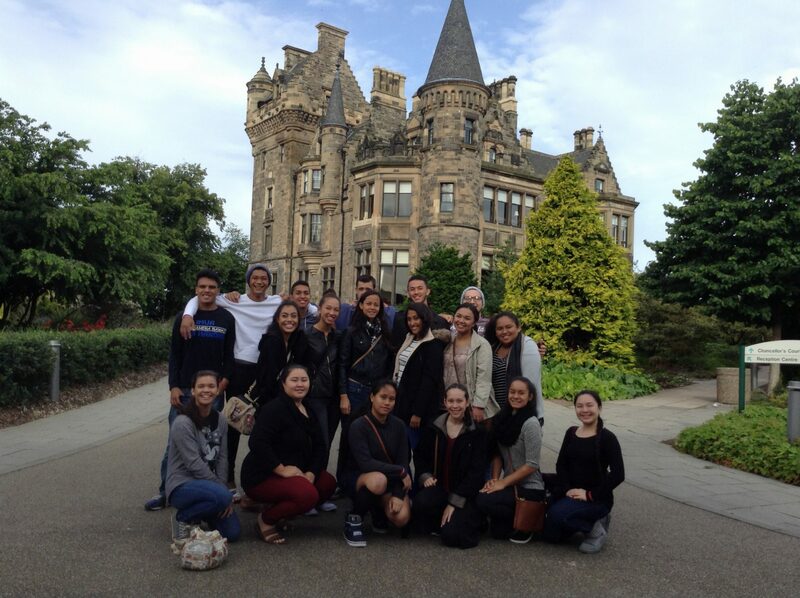 August 3rd began with a walk through Edinburgh to the Royal Mile and theSpace Triplex where the students will be performing. After an afternoon run-through of the show the students participated in a Scottish dance workshop.